“human security" (Iraq 1991), "Humanitarian intervention" (Kosovo, 1999), “self-defence” (Afghanistan 2001), "Pre-emptive/ preventive" attack (Iraq, 2003) "Responsibility to Protect (Haiti, 2004, Libya, 2011) or "will to intervene" (Mali, 2013). Each time the pretext was discredited, a new pretext emerged. RECOGNIZING that true security does not arise: through NATO expansion, through being a nuclear weapons alliance, and opposing the abolition of nuclear weapons, through coercing other states to increase their military budget, and purchase weapons like F 35 and armed drones, through destabilizing other nations, through setting up military bases around the world, through war games and military exercises, through circulating nuclear powered and nuclear arms capable vessel. Etc. (v) to ensure the preservation, conservation and protection of the environment, the respect for the inherent worth of nature beyond human purpose, to reduce the ecological footprint and to move away from the current model of unsustainable and excessive overconsumption. In 2019 currently the global community spends over 1.73 trillion billion on the military budget at a time when the right to housing, the right to food, the right to health care, the right to equality of all, the right to education, the right to safe drinking water, and the right to a safe environment have not been fulfilled. 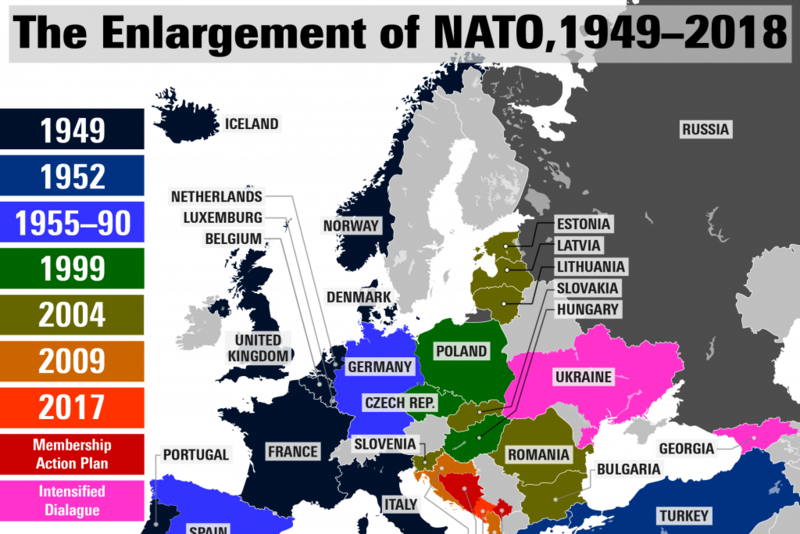 Provocative eastern expansion after promising Russia to that, if Russia agreed to the unification of Germany, NATO would not move one more inch to the East. NATO destabilized an area by offering one state an association with NATO; In 2006, during the election in El Salvador, Bush offered the Right-wing party in El Salvador a special association with NATO; this association intimidated both Nicaragua and Honduras (2006 Article in the Nicaraguan newspaper). Over the years, NATO has engaged in provocation for war through war games. culminating in 2018 the exercise, code-named Trident Juncture. A NATO is conducting its largest military exercise since the end of the cold war — close to the arctic circle in Norway — the alliance wants to keep the high north an area of low tension, NATO secretary general Jens Stoltenberg said of the exercise. Yet code-named Trident Juncture, has drawn Moscow's ire, accusing the alliance of stoking tensions in the region. Nearly 50,000 NATO soldiers — including about 2,000 Canadians — backed by some 250 aircraft, 65 ships and up to 10,000 vehicles from all 29 NATO countries, they began massive war games which involve land, sea, air and cyber capabilities. “human security" (Iraq 1991), "humanitarian intervention" (Kosovo, 1999), “self-defense” (Afghanistan 2001), "pre-emptive/ preventive" attack (Iraq, 2003) "responsibility to protect (Haiti, 2004, Libya, 2011) or "will to intervene" (Mali, 2013). each time the pretext was discredited, a new pretext emerged. • Former UN chief Kofi Annan blamed the 2003 US-led invasion of Iraq for the rise of the Islamic State (ISIS), warning that the Middle East must evolve and adapt for lasting peace. • The Security Council did not authorize the March 20, 2003 attack on Iraq. It unanimously passed Resolution 1441 on November 8, 2002, calling for new inspections intended to find and eliminate Iraq's weapons of mass destruction. (The Arms Control Association provides a chronology of previous weapons inspections in Iraq.) Iraq accepted the renewed inspections, which were to be carried out by UNMOVIC and the IAEA. it eventually was used against Libya. Concern grew as Sergei Lavrov, Russia's foreign minister, said he believed the military action was in breach of international law. "We consider that intervention by the coalition in what is essentially an internal civil war is not sanctioned by the UN security council resolution," he said. Russia abstained from the vote which resulted in resolution 1973.
against, with 5 abstentions (Brazil, China, Germany, India, Russian Federation), the Council authorized Member States, acting nationally or through regional organizations or arrangements, to take all necessary measures to protect civilians under threat of attack in the country, including Benghazi, while excluding a foreign occupation force of any form on any part of Libyan territory — requesting them to immediately inform the Secretary-General of such measures. Depleted Uranium or DU  encased bombs that have been used since 1991 by US and NATO forces knowing well that the use of DU weapons is illegal being weapons of mass destruction [WMD] and amounts to War Crimes. Article 35. BASIC RULES. 1. In any armed conflict, the right of the Parties to the conflict to choose methods or means of warfare is not unlimited. 2. It is prohibited to employ weapons, projectiles and material and methods of warfare of a nature to cause superfluous injury or unnecessary suffering It is prohibited to employ methods or means of warfare which are intended, or may be expected, to cause widespread, long-term and severe damage to the natural environment. may be expected, to cause widespread, long-term and severe damage to the natural environment. Article 36 -- New weapons in the study, development, acquisition or adoption of a new weapon, means or method of warfare, a High Contracting Party is under an obligation to determine whether its employment would, in some or all circumstances, be prohibited by this Protocol or by any other rule of international law applicable to the High Contracting Party. IN 2016 The US has stated that the treaty to ban nuclear weapons would be ineffective, with adverse consequences for security and would hinder the implementation of Article VI of the US constitution on international treaties. 3) We can use them first. 7) We can launch some on 15 minutes warning. The NATO states collectively spend Approximately 60% of the current 1.75 trillion global military budget in contravention of years of international Commitments are reallocate military expenses. For example, 1976 assessment of the military budget…. underway and Stephen Harper announced that Canada would purchase 65 fighter jets, through an untendered purchase. But there is another looming threat that needs to be addressed. Put simply: War and militarism also fuel climate change, and the Pentagon is one of the biggest culprits. more than 539,000 facilities at 5,000 sites covering more than 28 million acres. Thirteen former member states of the PIP (namely Albania, Bulgaria, Croatia, Czech Republic, Estonia, Hungary, Latvia, Lithuania, Montenegro, Poland, Romania, Slovakia, and Slovenia), have subsequently joined NATO. NATO builds relationships with partners through military-to-military cooperation on training, exercises, disaster planning and response, science and environmental issues, professionalization, policy planning, and relations with civilian government. PHILIPPE Kirsch the first President of ICC stated that the ICC would only take on the case if the state does not have a credible national judicial system to press charges against the perpetrator. Would this provision not exclude the leaders of NATO states and make them immune to prosecution? world’s first permanent, international judicial body capable of bringing perpetrators to justice and providing redress to victims when states are unable or unwilling to do so.